In the world of fiscal policy, there are actually two big debates. One debate revolves around the appropriate size of government in the long run. Folks on the left argue that government spending generates a lot of value and that bigger government is a recipe for more prosperity. Libertarians and their allies, by contrast, point out that most forms of government spending are counterproductive and that large public sectors (and the accompanying taxes) undermine economic performance. The other debate is focused on short-run economic effects, and revolves around the “Keynesian” argument that more government spending is a “stimulus” to a weak economy and that budget-cutting “austerity” hurts growth. Libertarians and other critics are generally skeptical that government spending boosts short-run growth and instead argue that the right kind of austerity (i.e., a lower burden of government spending) is the appropriate approach. Back in 2009 and 2010, I wrote a lot about the Keynesian stimulus fight. In more recent years, however, I have focused more on the debate over the growth-maximizing size of government. But it’s time to revisit the stimulus/austerity debate. The National Bureau of Economic Research last month released a new study by five economists (two from Harvard, one from NYU, and two from Italian universities) reviewing the real-world evidence on fiscal consolidation (i.e., reducing red ink) over the past several decades. This paper studies whether what matters most is the “when” (whether an adjustment is carried out during an expansion, or a recession) or the “how” (i.e. the composition of the adjustment, whether it is mostly based on tax increases, or on spending cuts). …We estimate a model which allows for both sources of non-linearity: “when” and “how”. Here’s a bit more about the methodology. 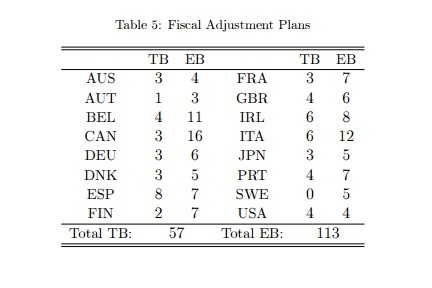 The fiscal consolidations we study are those implemented by 16 OECD countries (Australia, Austria, Belgium, Canada, Denmark, Finland, France, Germany, Ireland, Italy, Japan, Portugal, Spain, Sweden, United Kingdom, United States) between 1981 and 2014. …We also decompose each adjustment in its two components: changes in taxes and in spending. …we use a specification in which the economy, following the shift in fiscal policy, can move from one state to another. We also allow multipliers to vary depending on the type of consolidation, tax-based vs expenditure-based. …Our government expenditure variable is total government spending net of interest payments on the debt: that is we do not distinguish between government consumption, government investment, transfers (social security benefits etc) and other government outlays. …In total we have 170 plans and 216 episodes, of which about two-thirds are EB and one-third are TB. By the way, “EB” refers to “expenditure based” fiscal consolidations and “TB” refers to “tax based” consolidations. And you can see from Table 5 that some countries focused more on tax increases and others were more focused on trying to restrain spending. Congratulations to Canada and Sweden for mostly or totally eschewing tax hikes. Though I wonder how many of the 113 “EB” plans involved genuine spending reforms (probably very few based on this data) and how many were based on the fake-spending-cuts approach that is common in the United States. Let’s now look at some findings from the NBER study, starting with the fact that most consolidations took place during downturns, which certainly wouldn’t please Keynesians, but shouldn’t be too surprising since red ink tend to rise during such periods. …there is a relation between the timing and the type of fiscal adjustment and the state of the economy. Overall, adjustment plans are much more likely to be introduced during a recession. There was a consolidation in 62 out of 99 years of recession…, while we record a consolidation in only 13 over 94 years of expansion. …it is somewhat surprising that a majority of the shifts in fiscal policy devoted to reducing deficits are implemented during recessions. And here are the results that really matter. The economists crunched the numbers and found that tax increases impose considerable damage, whereas spending cuts cause very little harm to short-run performance. We find that the composition of fiscal adjustments is more important than the state of the cycle in determining their effect on output. Fiscal adjustments based upon spending cuts are much less costly in terms of short run output losses – such losses are in fact on average close to zero – than those based upon tax increases which are associated with large and prolonged recessions regardless of whether the adjustment starts in a recession or not. …what matters for the short run output cost of fiscal consolidations is the composition of the adjustment. Tax-based adjustments are costly in terms of output losses. Expenditure-based ones have on average very low costs. P.S. I mentioned above that Keynesians doubtlessly get agitated that governments engage in fiscal consolidation during downturns. This is why I’m trying to get them to support spending caps. The good news, from their perspective, is that the government’s budget would be allowed to grow when there’s a recession, albeit not very rapidly. The tradeoff that they must accept, however, is that spending would be limited to that modest growth rate even during years when there’s strong growth and the private sector is generating lots of tax revenue. Honest Keynesians presumably should yes to this deal since Keynes wanted restraint during growth years to offset “stimulus” during recession years. And economists at left-leaning international bureaucracies seem sympathetic to this tradeoff. I don’t think there are many honest Keynesians in the political world, however, so I’m not expecting to get a lot of support from my leftist friends in Washington. When I was younger, folks in the policy community joked that BusinessWeek was the “anti-business business weekly” because its coverage of the economy was just as stale and predictably left wing as what you would find in the pages of Time or Newsweek. Writing about the stagnation that is infecting western nations, the magazine beclowns itself by regurgitating stale 1960s-style Keynesianism. The article is worthy of a fisking (i.e., a “point-by-point debunking of lies and/or idiocies”), starting with the assertion that central banks saved the world at the end of last decade. During the financial crisis the Federal Reserve and other central banks were hailed for their actions: by slashing rates and printing money to buy bonds, they stopped a shock from becoming a depression. I’m certainly open to the argument that the downturn would have been far worse if the banking system hadn’t been recapitalized (even if it should have happened using the “FDIC-resolution approach” rather than via corrupt bailouts), but that’s a completely separate issue from whether Keynesian monetary policy was either desirable or successful. Regarding the latter question, just look around the world. The Fed has followed an easy-money policy. Has that resulted in a robust recovery for America? The European Central Bank (ECB) has followed the same policy. Has that worked? And the Bank of Japan (BoJ) has done the same thing. Does anyone view Japan’s economy as a success? At least the article acknowledges that there are some skeptics of the current approach. The central bankers say that ultra-loose monetary policy remains essential to prop up still-weak economies and hit their inflation targets. …But a growing chorus of critics frets about the effects of the low-rate world—a topsy-turvy place where savers are charged a fee, where the yields on a large fraction of rich-world government debt come with a minus sign, and where central banks matter more than markets in deciding how capital is allocated. The Economist, as you might expect, expresses sympathy for the position of the central bankers. In most of the rich world inflation is below the official target. Indeed, in some ways central banks have not been bold enough. Only now, for example, has the BoJ explicitly pledged to overshoot its 2% inflation target. The Fed still seems anxious to push up rates as soon as it can. The preceding passage is predicated on the assumption that there is a mechanistic tradeoff between inflation and unemployment (the so-called Phillips Curve), one of the core concepts of Keynesian economics. According to adherents, all-wise central bankers can push inflation up if they want lower unemployment and push inflation down if they want to cool the economy. 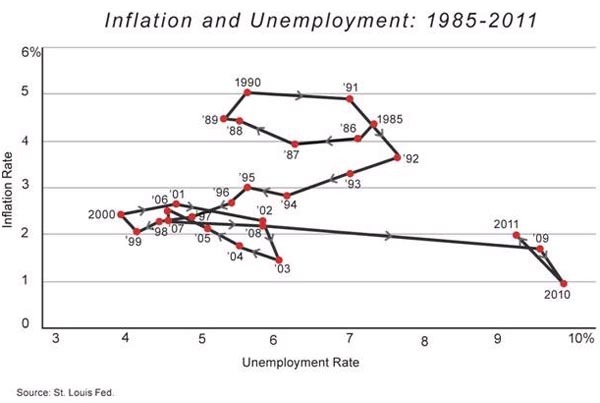 This idea has been debunked by real world events because inflation and unemployment simultaneously rose during the 1970s (supposedly impossible according the Keynesians) and simultaneously fell during the 1980s (also a theoretical impossibility according to advocates of the Phillips Curve). But real-world evidence apparently can be ignored if it contradicts the left’s favorite theories. That being said, we can set aside the issue of Keynesian monetary policy because the main thrust of the article is an embrace of Keynesian fiscal policy. …it is time to move beyond a reliance on central banks. …economies need succour now. The most urgent priority is to enlist fiscal policy. The main tool for fighting recessions has to shift from central banks to governments. As an aside, the passage about shifting recession fighting “from central banks to governments” is rather bizarre since the Fed, the ECB, and the BoJ are all government entities. Either the reporter or the editor should have rewritten that sentence so that it concluded with “shift from central banks to fiscal policy” or something like that. In any event, The Economist has a strange perspective on this issue. 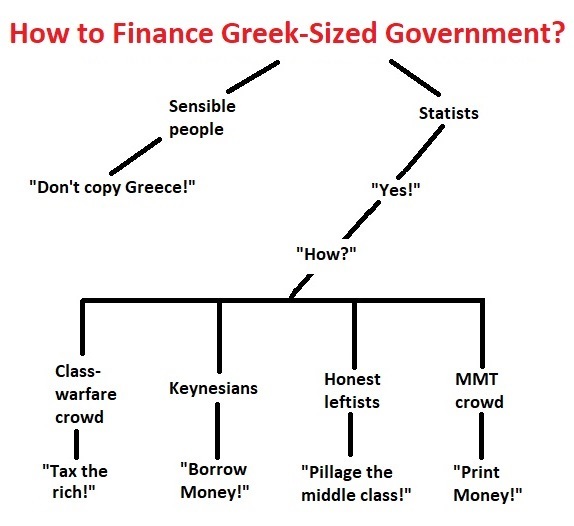 It wants Keynesian fiscal policy, yet it worries about politicians using that approach to permanently expand government. And it is not impressed by the fixation on “shovel-ready” infrastructure spending. The task today is to find a form of fiscal policy that can revive the economy in the bad times without entrenching government in the good. …infrastructure spending is not the best way to prop up weak demand. …fiscal policy must mimic the best features of modern-day monetary policy, whereby independent central banks can act immediately to loosen or tighten as circumstances require. So The Economist endorses what it refers to as “small-government Keynesianism,” though that’s simply its way of saying that additional spending increases (and gimmicky tax cuts) should occur automatically. …there are ways to make fiscal policy less politicised and more responsive. 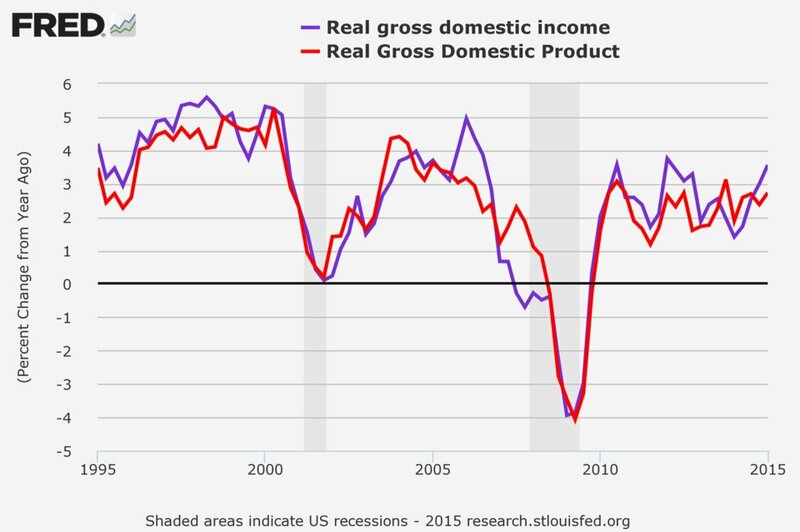 …more automaticity is needed, binding some spending to changes in the economic cycle. The duration and generosity of unemployment benefits could be linked to the overall joblessness rate in the economy, for example. In the language of Keynesians, such policies are known as “automatic stabilizers,” and there already are lots of so-called means-tested programs that operate this way. When people lose their jobs, government spending on unemployment benefits automatically increases. During a weak economy, there also are automatic spending increases for programs such as Food Stamps and Medicaid. I guess The Economist simply wants more programs that work this way, or perhaps bigger handouts for existing programs. 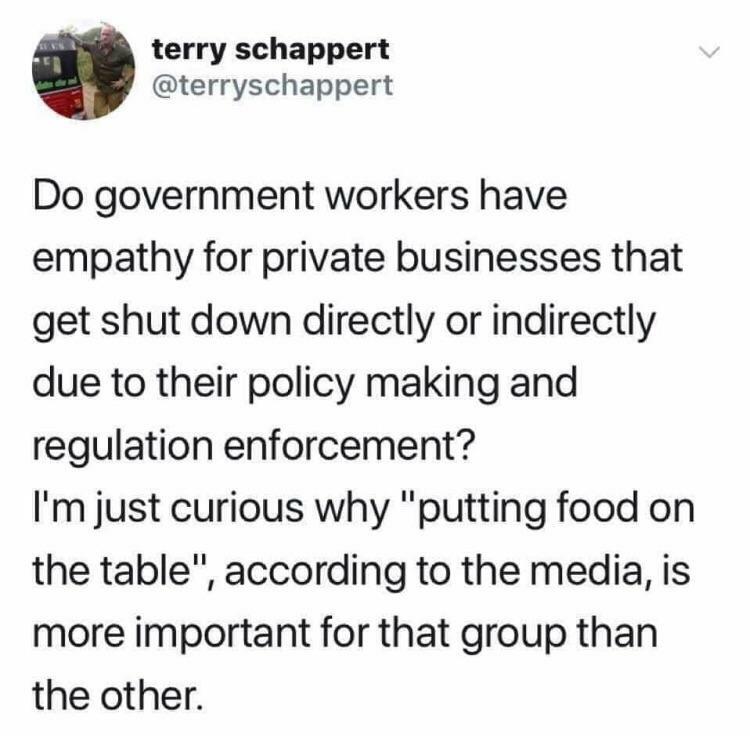 And the magazine views this approach as “small-government Keynesianism” because the spending increases theoretically evaporate as the economy starts growing and fewer people are automatically entitled to receive benefits from the various programs. Regardless, whoever wrote the article seems convinced that such programs help boost the economy. When the next downturn comes, this kind of fiscal ammunition will be desperately needed. Only a small share of public spending needs to be affected for fiscal policy to be an effective recession-fighting weapon. My reaction, for what it’s worth, is to wonder why the article doesn’t include any evidence to bolster the claim that more government spending is and “effective” way of ending recessions and boosting growth. Though I suspect the author of the article didn’t include any evidence because it’s impossible to identify any success stories for Keynesian economics. Did Keynesian spending boost the economy under Hoover? No. Did Keynesian spending boost the economy under Roosevelt? No. Has Keynesian spending worked in Japan at any point over the past twenty-five years? No. Did Keynesian spending boost the economy under Obama? No. Indeed, Keynesian spending has an unparalleled track record of failure in the real world. Though advocates of Keynesianism have a ready-built excuse. All the above failures only occurred because the spending increases were inadequate. But what do expect from the “perpetual motion machine” of Keynesian economics, a theory that is only successful if you assume it is successful? I’m not surprised that politicians gravitate to this idea. After all, it tells them that their vice of wasteful overspending is actually a virtue. But it’s quite disappointing that journalists at an allegedly economics-oriented magazine blithely accept this strange theory. P.S. My second-favorite story about Keynesian economics involves the sequester, which big spenders claimed would cripple the economy, yet that’s when we got the only semi-decent growth of the Obama era. P.P.S. My favorite story about Keynesianism is when Paul Krugman was caught trying to blame a 2008 recession in Estonia on spending cuts that occurred in 2009. P.P.P.S. Here’s my video explaining Keynesian economics. The War against Cash continues. In Part I, we looked at the argument that cash should be banned or restricted so governments could more easily collect additional tax revenue. In Part II, we reviewed the argument that cash should be curtailed so that governments could more easily impose Keynesian-style monetary policy. In Part III, written back in March, we examined additional arguments by people on both sides of the issue and considered the risks of expanded government power. Now it’s time for Part IV. Professor Larry Summers of Harvard University is President Obama’s former top economic adviser and he’s a relentless advocate of higher taxes and bigger government. If he favors an idea, it doesn’t automatically make it bad, but it’s surely a reason to be suspicious. So you won’t be surprised to learn that he wrote a column for the Washington Post applauding the move in Europe to eliminate €500 notes. Indeed, he wants to ban all large-denomination notes. There is little if any legitimate use for 500-euro notes. Carrying out a transaction with 20 50-euro notes hardly seems burdensome, and this would represent over $1,000 in purchasing power. Twenty 200-euro notes would be almost $5,000. Who in today’s world needs cash for a legitimate $5,000 transaction? …Cash transactions of more than 3,000 euros have in fact been made illegal in Italy, while France has placed the limit at 1,000 euros. …In contrast to the absence of an important role for 500-euro notes in normal commerce, these bills have a major role facilitating illicit activity, as suggested by their nickname —“Bin Ladens.” …Estimates by the International Monetary Fund and others of total annual money laundering consistently exceed $1 trillion. High-denomination notes also have a substantial role in facilitating tax evasion and capital flight. Who “needs cash” for transactions, he asks, but isn’t the real issue whether people should have the freedom to use cash if that’s what they prefer? Also, in dozens of trips to Europe since the adoption of the euro, I’ve never heard anyone refer to the €500 note as a “Bin Laden,” so I suspect that’s an example of Summers trying to demonize something that he doesn’t like. But perhaps the most important revelation from his column is that he admits there’s no evidence that crime would be stopped by his plan to restrict cash. To be sure, it is difficult to estimate how much crime would be prevented by stopping the creation of 500-euro notes. It would surely impose some burdens on criminals and might interfere with some transactions, which is not unimportant. Unsurprisingly, he wants to coerce other governments into restricting high-value notes. Europe has led on a significant security issue. But its action should be seen as a beginning, not an end. As a first follow-on, the world should demand that Switzerland stop issuing 1,000-Swiss-franc notes. After Europe’s action, these will stand out as the world’s highest-denomination note by a huge margin. Switzerland has a long and unfortunate history with illicit finance. It would be tragic if it were to profit from criminal currency substitution following Europe’s bold step. …There would be a strong case for stopping the creation of notes with values greater than perhaps $50. Summers isn’t the only academic from Harvard who is agitating to restrict cash. Prof. Kenneth Rogoff (who’s also the former Chief Economist at the IMF) recently wrote a piece for the Wall Street Journal explaining his hostility. …paper currency lies at the heart of some of today’s most intractable public-finance and monetary problems. …There is little debate among law-enforcement agencies that paper currency, especially large notes such as the U.S. $100 bill, facilitates crime: racketeering, extortion, money laundering, drug and human trafficking, the corruption of public officials, not to mention terrorism. At the risk of bursting his balloon, cash played almost no role in the most notorious terrorist event, the 9-11 attacks. And Rogoff admits that bad guys would use easy substitutes. There are substitutes for cash—cryptocurrencies, uncut diamonds, gold coins, prepaid cards. So he then dredges up the argument that cash facilitates tax evasion. Cash is also deeply implicated in tax evasion, which costs the federal government some $500 billion a year in revenue. According to the Internal Revenue Service, a lot of the action is concentrated in small cash-intensive businesses, where it is difficult to verify sales and the self-reporting of income. I addressed these issues in Part I of this series, but I’ll simply add that the academic evidence shows that lower tax rates are the best way of boosting tax compliance (as even the IMF has admitted). To his credit, Rogoff acknowledges that his preferred policy would reduce the rights of individuals. Perhaps the most challenging and fundamental objection to getting rid of cash has to do with privacy—with our ability to spend anonymously. But where does one draw the line between this individual right and the government’s need to tax and regulate. His main argument is that our rights should be reduced to give government more power. He especially wants central bankers to have more power to impose Keynesian monetary policy. Cutting interest rates delivers quick and effective stimulus by giving consumers and businesses an incentive to borrow more. It also drives up the price of stocks and homes, which makes people feel wealthier and induces them to spend more. Countercyclical monetary policy has a long-established record, while political constraints will always interfere with timely and effective fiscal stimulus. Yes, he’s right. Activist monetary policy does have a long-established track record. It played a key role in causing the Great Depression, the 1970s stagflation, and the recent financial crisis. And Rogoff wants the arsonists at the Fed to have more power to create boom-bust cycles. In principle, cutting interest rates below zero ought to stimulate consumption and investment in the same way as normal monetary policy, by encouraging borrowing. Unfortunately, the existence of cash gums up the works. If you are a saver, you will simply withdraw your funds, turning them into cash, rather than watch them shrink too rapidly. Enormous sums might be withdrawn to avoid these loses, which could make it difficult for banks to make loans—thus defeating the whole purpose of the policy. Take cash away, however, or make the cost of hoarding high enough, and central banks would be free to drive rates as deep into negative territory as they needed in a severe recession. …if a strong dose of negative rates can power an economy out of a downturn, it could bring inflation and interest rates back to positive levels relatively quickly, arguably reducing vulnerability to bubbles rather than increasing it. Needless to say, I disagree with Rogoff and agree with Thomas Sowell that an institution that repeatedly screws up shouldn’t be given more power. Especially since I’m concerned that the option to use bad monetary policy may actually be one of the excuses that politicians use for not fixing the problems that actually are hindering growth. So, yes, instead of expanding their power, I want to clip the wings of the Federal Reserve and other central banks. Now let’s consider the harm that would be caused by restricting or banning cash. Two professors from NYU Law School looked at some of the logistical issues of a shift to digital money. The echoed some of the points raised by Summers and Rogoff, but they also pointed out some downsides. Such as government being able to monitor everything we buy. …centralization of banking under this system would also create a Leviathan with the power to monitor and control the personal finances of every citizen in the country. This is one of the chief reasons why many are loath to give up on hard currency. With digital money, the government could view any financial transaction and obtain a flow of information about personal spending that could be used against an individual in a whole host of scenarios. It also would cause a mess because so many people around the world rely on dollars, something that’s beneficial to the U.S. Treasury and foreigners from places with untrustworthy central banks. …a transition to digital currency might come at a large cost for the U.S. in particular, because the dollar remains the world’s de facto reserve currency. The U.S. collects enormous seigniorage revenue that accrues to the economy when the Federal Reserve prints dollars that are exported abroad in exchange for foreign goods and services. These bank notes ultimately end up in countries with less reliable central banks where locals prefer to hold U.S. currency instead of their own. Forfeiting this franchise as the world’s reserve currency might be too costly, as the U.S. currency held abroad exceeds half a trillion dollars, according to reliable estimates. The rhetoric of the anti-high-denomination gang has gotten increasingly shrill. …Charles Goodhart in September called the European Central Bank and the Swiss National Bank “shameless” for issuing “vastly high-denomination notes,” namely the €500 and SWF 1000, “which are there to finance the drug deals.” …I have an alternative suggestion for removing $100 bills from the illegal drug trades: Legalize the trade. …My suggestion would reduce the demand for high-denomination currency. Nice plug for sensible libertarian policy. But even if one favors drug prohibition, that doesn’t mean currency prohibition will be effective. Today’s high-denomination-currency prohibitionists, like today’s drug prohibitionists and yesterday’s alcohol prohibitionists, only think about the supply side. But does anyone think that banning the $100 bill during Prohibition (when it had a purchasing power more than 11 times today’s, as evaluated using the CPI) and even higher denominations would have put a major dent in the rum-running business, if an army of T-Men couldn’t? …eliminating high denomination, high value notes we would make life harder” for such criminal enterprises. No doubt. But we would also make life harder for everyone else. The rest of us also find high-denomination notes convenient now and again for completely legal and non-controversial purposes, like buying automobiles and carrying vacation cash compactly. …currency prohibitionists too often regard those who defend high-denomination notes not as intellectually honest but mistaken opponents, but rather as morally suspect characters. Larry Summers goes out of his way to smear an ECB executive from Luxembourg (who has had the temerity to ask for better evidence before accepting the case for prohibiting high-denomination notes)… The case for prohibiting large-denomination currency, to summarize, is largely based on guilt by association or on wishful thinking about the benefits of allowing greater range of action to discretionary monetary policy. On the topic of crime and cash, an article for the WSJ debunks one of the left’s main talking points. If using cash is supposed to be a sign of criminal activity, why are the world’s two most cash-friendly nations also two of the safest and crime-free countries? Are Japan and Switzerland havens for terrorists and drug lords? High-denomination bills are in high demand in both places, a trend that some politicians claim is a sign of nefarious behavior. Yet the two countries boast some of the lowest crime rates in the world. The cash hoarders are ordinary citizens… The current hoarding in Switzerland and Japan thus underscores one of many ways in which cash is a basic tool of economic liberty: It lets people shield themselves from monetary policies that would force their savings into weak economies that can’t attract sufficient spending or investment on their own. These economies need reforms that boost incentives to work and invest, not negative interest rates and cash limits that raid the bank accounts of law-abiding citizens. A column by Sarah Jeong in Bloomberg explores some of the additional implications of cash restrictions. …wherever information gathers and flows, two predators follow closely behind it: censorship and surveillance. The case of digital money is no exception. Where money becomes a series of signals, it can be censored; where money becomes information, it will inform on you. …the Department of Justice began to come under fire for Operation Choke Point…the means were highly dubious. …the DOJ got creative, and asked banks and payment processors to comply with government policies, and proactively police “high-risk” activity. Banks were asked to voluntarily shut down the kinds of merchant activities that government bureaucrats described as suspicious. The price of resistance was an active investigation by the Department of Justice. …Where paternalism is bluntly enforced through a bureaucratic game of telephone, unpleasant or even inhumane unintended consequences are bound to result. …the cashless society offers the government entirely new forms of coercion, surveillance, and censorship. …As paper money evaporates from our pockets and the whole country—even world—becomes enveloped by the cashless society, financial censorship could become pervasive, unbarred by any meaningful legal rights or guarantees. Her observation on Operation Choke Point is very important since that campaign has been a chilling example of how government abuses its power in the financial sector. Megan McArdle’s Bloomberg column touches on some additional concerns. What’s not to like? Very little. Except, and I’m afraid it’s a rather large exception, the amount of power that this gives the government over its citizens. Consider the online gamblers who lost their money in overseas operations when the government froze their accounts. Now, what they were doing was indisputably illegal in these here United States, and I am not claiming that they were somehow deeply wronged. But consider how immense the power that was conferred upon the government by the electronic payments system; at a word, your money could simply vanish. …Unmonitored resources like cash…create a sort of cushion between ordinary people and a government with extraordinary powers. Removing that cushion leaves people who aren’t criminals vulnerable to intrusion into every remote corner of their lives. …If we want to move toward a cashless society — and apparently we do — then we also need to think seriously about limiting the ability of the government to use the payments system as an instrument to control the behavior of its citizens. For what it’s worth, one way of getting the benefits of a cashless world without the risks is with private digital monies such as bitcoin. Steve Forbes nails the issue. Excellent point. Politicians should concentrate on restricting the freedom of bad guys, not ordinary citizens. So what are the implications of the war against cash? They aren’t pretty. The real reason for this war on cash–start with the big bills and then work your way down–is an ugly power grab by Big Government. People will have less privacy: Electronic commerce makes it easier for Big Brother to see what we’re doing, thereby making it simpler to bar activities it doesn’t like, such as purchasing salt, sugar, big bottles of soda and Big Macs. Steve raises a good point about tracking certain purchases. Imagine the potential mischief if politicians had a mechanism to easily impose discriminatory taxes on disapproved products. He also notes that the war on cash is motivated by a desire to more effectively implement an ineffective policy. Policymakers in Washington, Tokyo and the EU think the reason that their economies are stagnant is that ornery people aren’t spending and investing the way they should. How to make these benighted, recalcitrant beings do what they’re supposed to do? The latest nostrum from our overlords is negative interest rates. If people have to pay fees to store their money, as they do to put their stuff in storage facilities, then, by golly, they might be more inclined to spend it. And Steve correctly observes that bad monetary policy is now an excuse to not fix the problems that actually are contributing to economic stagnation. Manipulating the value of money and controlling interest rates, i.e., the price of money, never works. Money measures value. It is a claim on services and is a tool for facilitating commerce and investing. The reason economies around the world are in the ditch–which is fueling anger, discontent and ugly politics–is structural, government-created barriers: unstable money, suffocating rules and too-high rates of taxation. James Grant, in a column for the Wall Street Journal, is not impressed by the anti-cash agitprop and specifically debunks some of the arguments put forth by Rogoff. He starts with some very sensible observation that politicians should reform drug laws and tax laws rather than restricting our freedom to use cash. Terrorists traffic in cash, Mr. Rogoff observes. So do drug dealers and tax cheats. Good, compliant citizens rarely touch the $100 bills that constitute a sizable portion of the suspiciously immense volume of greenbacks outstanding—$4,200 per capita. Get rid of them is the author’s message. Then, again, one could legalize certain narcotics to discommode the drug dealers and adopt Steve Forbes’s flat tax to fill up the Treasury. Mr. Rogoff considers neither policy option. Government control is not only his preferred position. It is the only position that seems to cross his mind. Grant makes the (obvious-to-folks not-in-Washington) point that restricting cash to enable Keynesian monetary policy is akin to throwing good money after bad. Mr. Rogoff lays the blame for America’s lamentable post-financial-crisis economic record not on the Obama administration’s suffocating tax and regulatory policies. The problem is rather the Fed’s inability to put its main interest rate, the federal funds rate, where it has never been before. In a deep recession, Mr. Rogoff proposes, the Fed ought not to stop cutting rates when it comes to zero. It should plunge right ahead, to minus 1%, minus 2%, minus 3% and so forth. At one negative rate or another, the theory goes, despoiled bank depositors will stop saving and start spending. …What would you do if your bank docked you, say, 3% a year for the privilege of holding your money? Why, you might convert your deposit into $100 bills, rent a safe deposit box and count yourself a shrewd investor. Hence the shooting war against currency. …In the topsy-turvy world of Mr. Rogoff, negative rates would be the reward to impetuousness and the cost of thrift. …Never mind that, in post-crisis America, near 0% interest rates have failed to deliver the promised macroeconomic goods. Come the next crackup, Mr. Rogoff would double down—and down. And he echoes the insights of Austrian-school scholars about how easy-money policies are the cause of problems rather than the cure. Let’s close with the good news is that Switzerland doesn’t seem very interested in following Europe and the United States down the primrose path of seeking to curtail monetary freedom. Thank goodness for the “sensible Swiss.” On so many issues, Switzerland is a beacon of common sense and individual freedom. But the International Monetary Fund is causing me to reconsider my views. By contrast, you do get some worthwhile research from the career economists (on issues such as spending caps, fiscal decentralization, and the Laffer Curve). But that kind of professional analysis gets almost no attention. 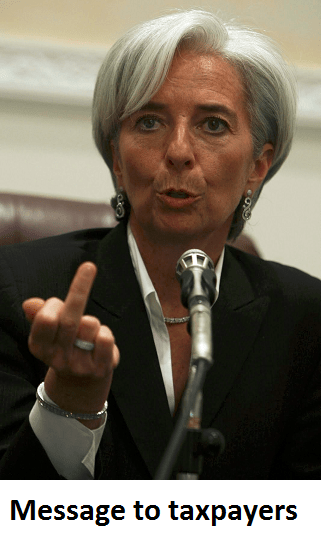 The IMF’s grossly overpaid (and untaxed!) Managing Director seemingly devotes all her energy to pushing and publicizing bad policies. The Wall Street Journal reports, for instance, that the IMF is following the OECD down the primrose path of fiscal recklessness and is also urging nations to throw good money after bad with another Keynesian spending spree. The world’s largest economies should agree to a coordinated increase in government spending to counter the growing risk of a deeper global economic slowdown, the International Monetary Fund said Wednesday. …the IMF is pushing G-20 finance ministers and central bankers meeting in Shanghai later this week to agree on bold new commitments for public spending. Fortunately, at least one major economy seems uninterested in the IMF’s snake-oil medicine. The IMF’s calls will face some resistance in Shanghai. Fiscal hawk Germany has been reluctant to heed long-issued calls by the U.S., the IMF and others to help boost the eurozone’s weak recovery with public spending. Hooray for the Germans. I don’t particularly like fiscal policy in that nation, but I at least give the Germans credit for understanding at the end of the day that 2 + 2 = 4. I’m also hoping the British government, which is being pressured by the IMF, also resists pressure to adopt Dr. Kevorkian economic policy. The International Monetary Fund has urged the UK to ease back on austerity… IMF officials said the Treasury had done enough to stabilise the government’s finances for it to embark on extra investment spending… The Treasury declined to comment on the IMF report. The report said: “Flexibility in the fiscal framework should be used to modify the pace of adjustment in the event of weaker demand growth.” …Osborne has resisted attempts to coordinate spending by G20 countries to boost growth, preferring to focus on reducing the deficit in public spending to achieve a balanced budget by 2020. 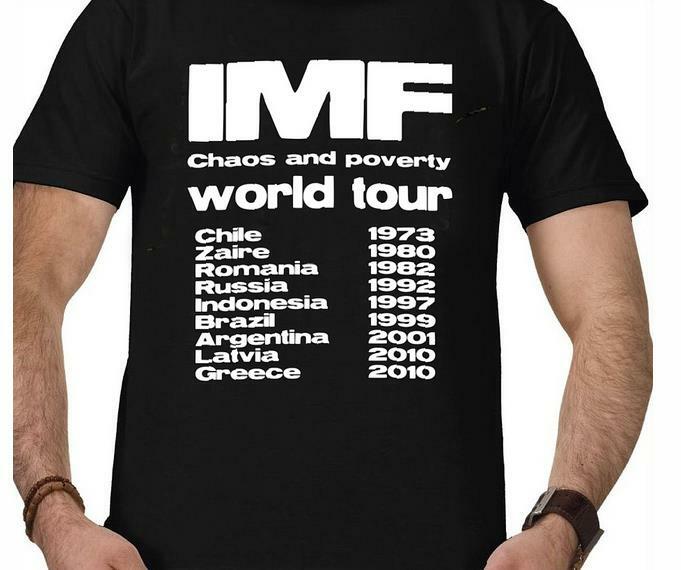 But you’ll be happy to know the IMF doesn’t discriminate. It balances out calls for bad policy in the developed world with calls for bad policy in other places as well. And the one constant theme is that taxes always should be increased. I wrote last year about how the IMF wants to sabotage China’s economy with tax hikes. Well, here are some excerpts from a Dow Jones report on the IMF proposing higher tax burdens, tax harmonization, and bigger government in the Middle East. The head of the International Monetary Fund on Monday urged energy exporters of the Middle East to raise more taxes… “These economies need to strengthen their fiscal frameworks…by boosting non-hydrocarbon sources of revenues,” Christine Lagarde said at a finance forum in the United Arab Emirates capital. …Ms. Lagarde called on the Persian Gulf states to introduce a valued added tax, which, even at a relatively low rate, could lift gross domestic product by 2%, she said. …Ms. Lagarde, who on Friday clinched a second five-year term as the IMF’s managing director, also urged governments in the region to consider raising corporate income taxes and even prepare for personal income taxes. Income taxes in particular could prove a sensitive move in the Gulf, which in recent decades has attracted millions of workers from abroad by offering, among other things, light-touch tax regimes. Ms. Lagarde also wants to discourage “overly aggressive tax competition” among countries that allow international companies and wealthy individuals to shift their wealth to lower tax destinations. Wow, Ms. Lagarde may be the world’s most government-centric person, putting even Bernie Sanders in her dust. She managed, in a single speech, to argue that higher taxes “strengthen…fiscal frameworks” even though that approach eventually leads to massive fiscal instability. She also apparently claimed that a value-added tax could boost economic output, an idea so utterly absurd that I hope the reporter simply mischaracterized her comments and that instead she merely asserted that a VAT could transfer an additional 2 percent of the economy’s output into government coffers. And she even urged the imposition of income taxes, which almost certainly would be a recipe for turning thriving economies such as Dubai back into backward jurisdictions where prosperity is limited to the oil-dependent ruling class. And it goes without saying that the IMF wants to export bad policy to every corner of the world. The IMF chief said taxation allows governments to mobilize their revenues. She noted, however, that the process can be undermined by “overly aggressive tax competition” among countries, and companies abusing the system of international taxation. …She argued that the automatic exchange of taxpayer information among governments could make it harder for businesses to follow the scheme. And don’t forget that the IMF oftentimes will offer countries money to implement bad policy, like when the bureaucrats bribed Albania to get rid of its flat tax. P.S. Now perhaps you’ll understand why I was so disappointed that last year’s budget deal included a provision to expand the IMF’s authority to push bad policy around the world. P.P.S. In other words, American taxpayers are being forced to subsidize the IMF so it can advocate higher taxes on American taxpayers! Sort of like having to buy a gun for the robber who wants to steal your money. P.P.P.S. Though I’ll also be grateful that the IMF inadvertently and accidentally provided some very powerful data against the value-added tax.